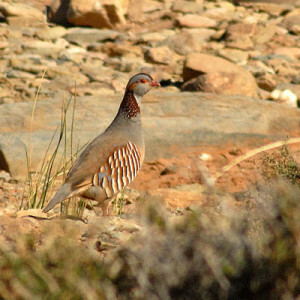 You will find partridge Gambra companies with more than 20 birds. This is a difficult hunting over rough roads and partridges spring before you as rockets. Snipe hunt ahead is stationary or in irrigated plains. TERRITORY: 30,000 Ha (3 twin reserves) in the heart of Western High Atlas to 85 km from Marrakech. Altitude 1 000-2 100m. Land diverse mountains for sport hunting, small hills for easier hunting. Varied landscapes: rocky terrain, small juniper forests, small oaks, prickly pears, faux-alfa, terraced fields.